Born on May 26, 1886, in Srednike, Lithuania, he was the youngest of four children of Rabbi Moses Reuben Yoelson and his wife, Naomi (Cantor). Anti-Jewish pogroms were common and the family immigrated to Washington, D.C., in 1880, where Rabbi Yoelson obtained a job as a cantor in a synagogue. Jolson's mother died when he was 10. His formal education wasn't much but he learned much more from the streets, where he would sing and dance on the corner to earn spending money. In constant conflict with his father, who wanted him to follow a religious life, Al ran away to New York to join his older brother, Harry, who had left home and changed his name to Jolson. 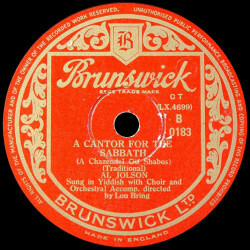 Al also changed his family name to Jolson and in 1899, he appeared as an extra in a Jewish play called Children of the Ghetto. At 15, he joined his brother in a three-man comedy act that toured the vaudeville circuits. They were known as Jolson, Palmer and Jolson. It was during this tour that he used burnt cork to darken his face, which became his trademark in show business. After a few years with the group, he left them to be on his own. Jolson, who was not used to the pressures of delivering a set script, loved to improvise and to ad lib during his act. While he was in San Francisco playing the small night clubs, he decided to liven up his act. He came out in black face and sang a few songs with a southern style. The audience called him back for three encores and he was on his way to stardom. He appeared in Hammerstein's shows in New York and then he went to work for the Schuberts in 1911. In the show Bombo, 1921, he introduced his famous song "My Mammy" and three other songs that were to be a part of his fame: "Toot, Toot, Tootsie," "California, Here I Come" and "April Showers." His records sold in the millions. In 1927, Jolson was the first to star in a talking picture, The Jazz Singer, based on his own life. The talking picture put an end to the silent movies of the day and Jolson's career and success moved forward. He worked with Parkyakarkas and Martha Rae in a comedy radio series for the Columbia Broadcasting System. 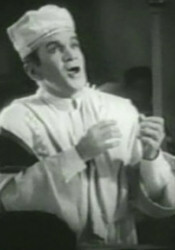 During World War II, Jolson performed at the USOs at home and abroad. During the Korean War, he gave 42 shows in 16 days. Proud of the soldiers, he said, after returning home, "I am going to look over my income tax return to make sure that I paid enough. These guys are wonderful." Shortly after returning from a strenuous entertainment trip to Korea, Jolson had a heart attack and died in San Francisco, on October 23, 1950. He was given a Jewish funeral and interred at the Hillside Memorial Park, in Los Angeles. He left millions to Jewish and other charities and received posthumously the Congressional Order of Merit.